Horses are the ideal animal to look at when you want to look at evolution. There is a great deal of information about the evolution of the horse and it can serve to teach us a bit about how evolution takes its twists and turns. The first horse is considered to be Hyracotherium who lived about 54 million years ago. He was a little larger than a decent sized housecat – about 20 inches at the shoulder. He had 4 padded toes (padded like a dog’s) on his front feet and 3 padded toes on his back feet. The main toe was the center toe but, for now, he moved on all of them. The old horse evolution line says that the horse grew larger and only one toe was used on each foot, the other toes grew smaller and no longer touched the ground. The pad grew harder and became a hoof. And, eventually, the horse only had one hoof per foot and grew to the size we see today. However, as happens in science, this picture has changed a bit. The story of the horse as it is currently known is a bit more complicated and more interesting. Hyracotherium, the first horse, was followed by Orohippus and Epihippus. The differences seem to be minor. The teeth changed slightly and the position of the eyes moved on the skull. Then we come to Mesohippus (about 40-30 million years ago) and there is a sudden change. Mesohippus is about 24 inches high with 3 toes on the front and 3 on the back. There are also some changes in the teeth. 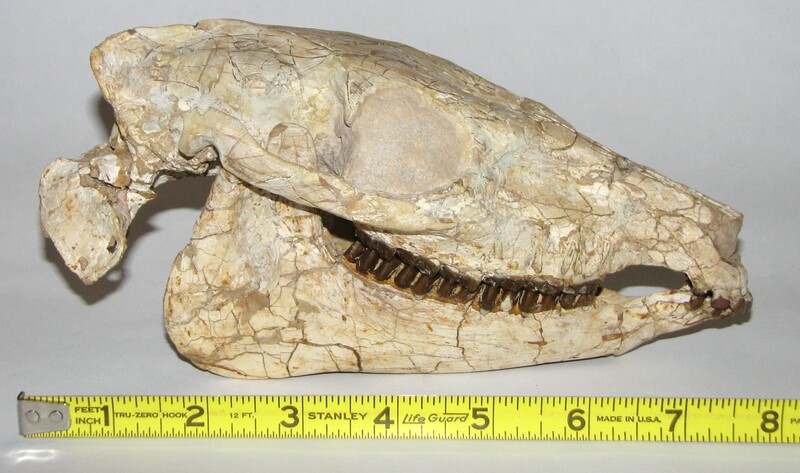 This is a Mesohippus skull. The brain cast on the left was made naturally when the Mesohippus died and the brain cavity filled with soil. 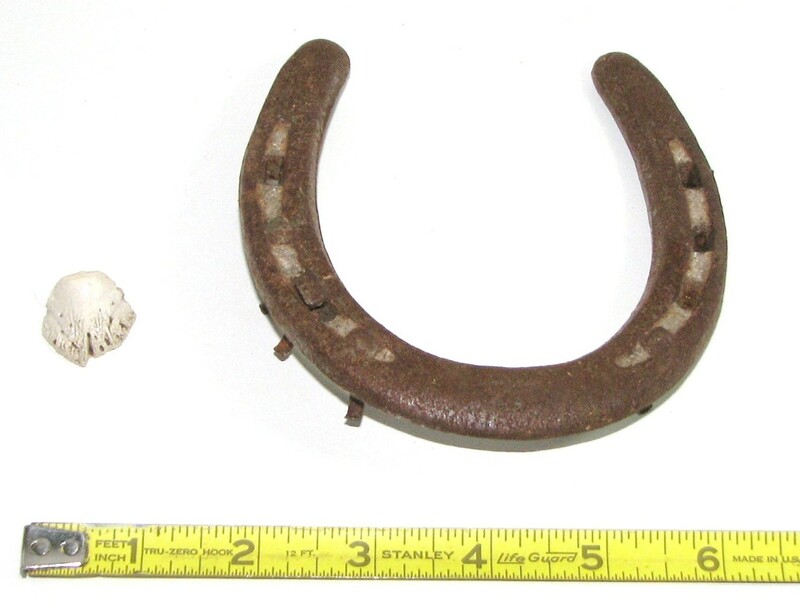 Above, on the right is the Mesohippus hoof compared with a horseshoe used on a horse from today. 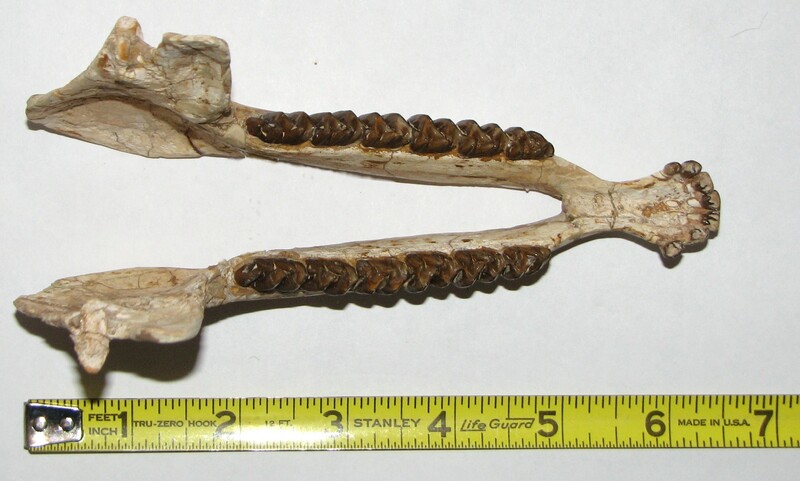 Hyracotherium teeth show teeth that were used for a variety of foods. Possibly rough plant material as well as fruit. 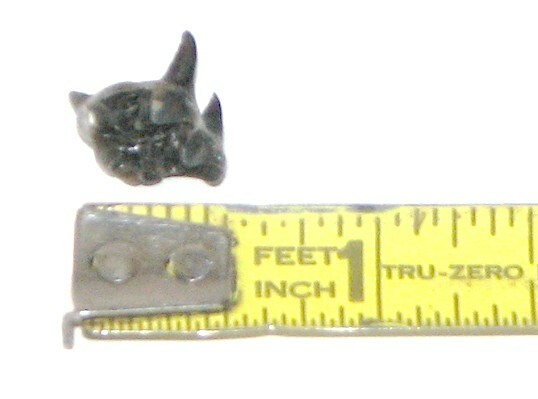 Hyracotherium had definite molars and pre-molars (below). Miohippus is the next in line after Mesohippus (36 million years ago). Miohippus (above), the next horse in the horse evolution chain, had a longer skull than Mesohippus. Both Miohippus and Mesohippus lived together for about 4 million years. After Miohippus the horses seem to have gone wild. Several horses branched off and grew both larger (Hypohippus and Megahippus) and smaller (as in the pigmy horse Archaeohippus). Archaeohippus seems to have not survived for too long. 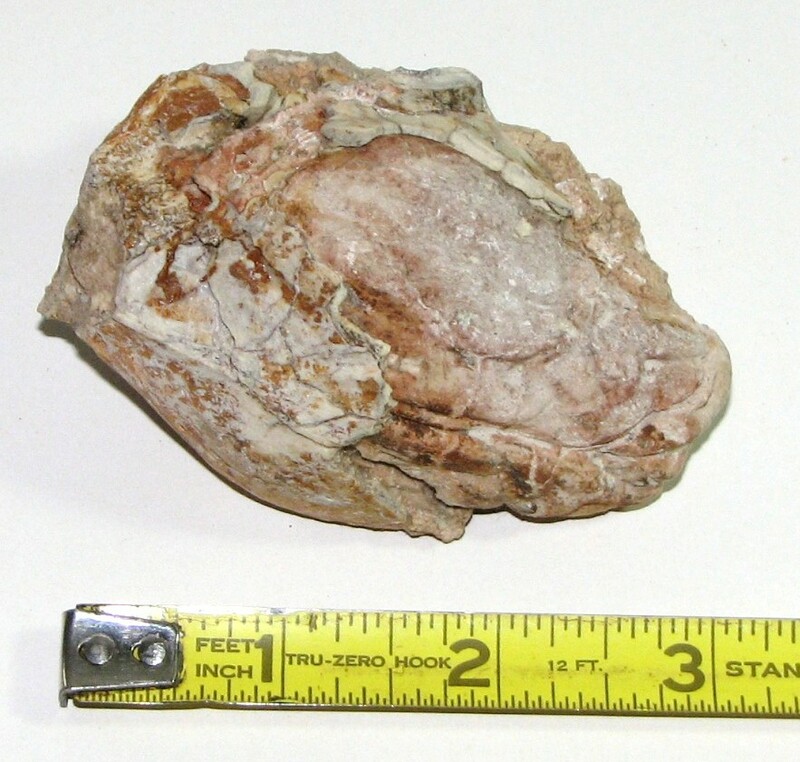 Above is an Archaeohippus molar. 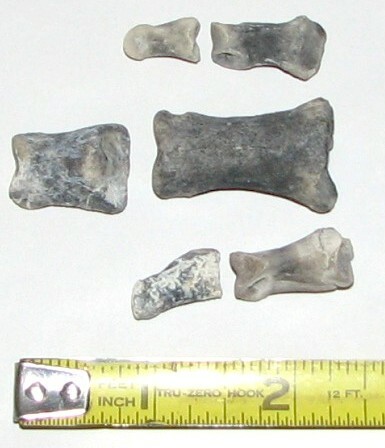 You can compare its size with that of the Mesohippus in the above photos. 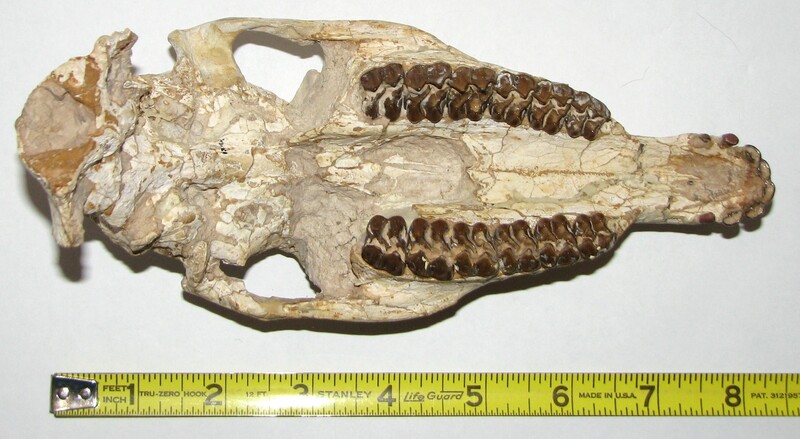 Even though it came after Mesohippus its tooth is actually a little smaller. One of these new horses, Kalobatippus evolved into Parahippus (23 million years ago) and Parahippus evolved into Merychippus. Merychippus (17 million years ago) grew to about 40 inches tall and was a little more like what you think of when you think of a horse. 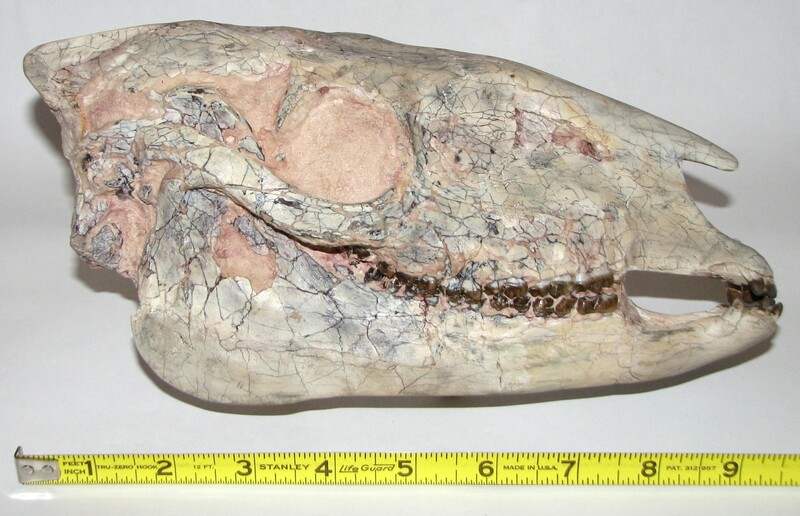 Larger brain, eyes further back in the skull, longer nose … but still 3 toes on each foot. 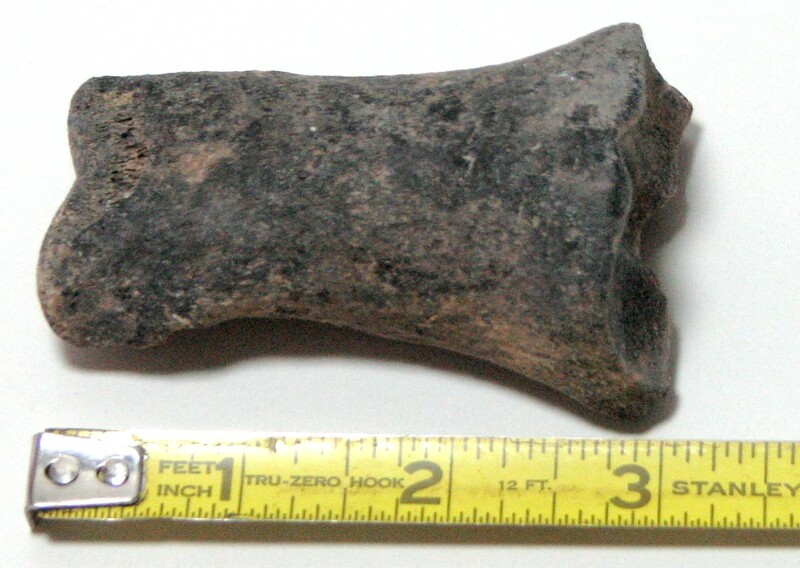 For comparison here is the foot of Merychippus (left below - hooves not shown) compared to a modern horse toe bone (photo on right - 2nd phalanx) 1 million years old. About 15 million years ago Merychippus evolved into about 19 other kinds of horse. At least one of these was smaller. As you can tell, the horse line is like a tree with branches coming off in all directions. A bit messy but what you might expect from evolution. Well, one of these branches lead to the horse Astrohippus (10 million years ago) which had only one toe/hoof on each foot. Something to consider in looking at the horses and examining their teeth: While the horse was changing so was their food. The Hyracotherium has the bumpy teeth that were used to chew rough vegetation. Today’s horse has a smoother tooth that is used to chew soft grass. As the horse was developing so was grass. Grass started to spread and provide more food for the smooth-toothed horse. The horse had more food, could grow bigger, and adapted to life on the plains. But at the end of the trail, today, we are left with only the Equus line remaining. The horse we’ve come to know. 1. During the evolution of a line the earlier animal does not just die off and the newer one start up. They co-exist for a period of time. 2. Evolution is not always a straight line process moving toward what we think of as the final product. Horses got larger, horses got smaller. Sometimes in the same period of time. 3. There is no “final goal”. There was a variety of horses at various times. The one we know happened to have survived while the others, for whatever reasons, died off. 4. Evolution can take a sudden turn but, usually, is a very long process. We looked at the change in the horse and it took almost 55 million years to get to where it is today. By the time Equus, our modern horse, arrived about 4 million years ago man, as we know him, was still not on the scene. Man, especially modern man, has never seen any horse but Equus.